To put Pat Fitzgerald into perspective, consider him the Wildcats prodigal son. He led them to insanely successful seasons in 95 and 96 as linebacker. He then became the youngest coach in Div. 1 history, and was also inducted into the college football hall of fame. Think of it as if Chris Spielman didn't have success with the Lions and returned to tOSU to coach the buckeyes. That's what Pat Fitzgerald means to NU fans. 2009 was an acceptable season for Northwestern football. An impressive 3-0 November slate with wins at Iowa and the season finale against Wisconsin saved the year for the Wildcats. Early season losses to Syracuse and Minnesota thwarted any honest hopes of improving on 2008's 9-4 record. Let's face it, even at 8-5, or 9-4, Northwestern simply isn't taken seriously in the Big Ten. Sure, they knocked off Michigan in 08...who didn't? And I like Pat Fitzgerald, and I think he's probably the greatest thing to ever happen to NU Football. And they might be that little school that could...but seriously, until they start winning Big Ten titles and winning bowl games, we're going to just keep treating NU like a second-class Big Ten football team. And as long as they continue to schedule like one, there's really no choice. 2010 could be a great season for NU as their schedule, as usual, lines them up perfectly for a successful year. A road trip to Vanderbilt to start the season is the only real test until they travel to Minneapolis on 10/2. Both Michigan and tOSU stay off their schedule again this year, so home games against Sparty and Iowa, and road trips to Happy Valley and Madison are the big tests for this squad. 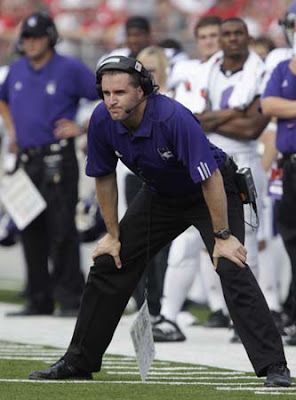 I don't want to know what it would take for Pat Fitzgerald to get let go in Evanston. The dozen or so NU fans out there seem to love him regardless, so I assume he's pretty safe for now. 21 times, this man has lost. Only one of those came at the hands of the Wolverines in 2003. 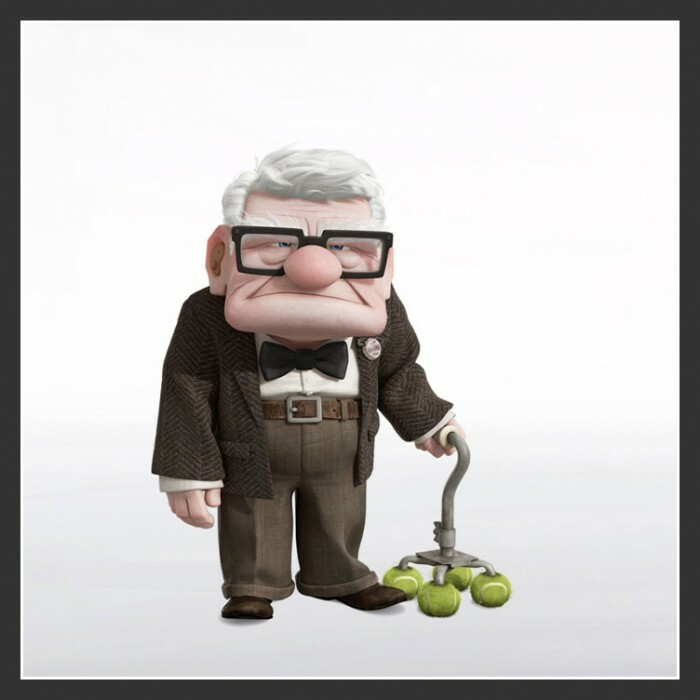 I hate this man with the heat of a thousand burning suns. Like we noted last year, calling Jo-Pa the "head coach" requires an asterisk. OC Galen Hall and DC Tom Bradley are more than just assistants these days. With Joe more of a figure-head for the program, we must treat him as such. But just as long as Joe is at Penn State, so will be his loyal assistants. Job security has not made this staff soft, however. Penn State is a dominant force in the Big Ten. 2009 saw many seniors really hit their stride, most notable Darryl Clark, as the Lions blew through a laughable non-conf schedule. But that cake-walk did not prepare the Lions for their Big Ten opener loss to Iowa which seriously derailed any thoughts of an outright Big Ten title. They rebounded well to win 5 straight before the showdown with #12 tOSU. With the Buckeyes prevailing, the Lions had to wash away that bitter disappointment with a couple blowout wins against Indiana and Sparty before going to the Capital One Bowl to cap off another pretty good year with a win against LSU. I suspect 2010 will be a tough one for Nittany Lions fans. They will not win enough to improve over last years 11-win season, especially with road trips to (ah-hem) Tuscaloosa, Iowa City and Columbus. But 8-9 wins is surely within the realm of possibility. Some suspect the QB position will flounder in 2010...that surely is the wild card. 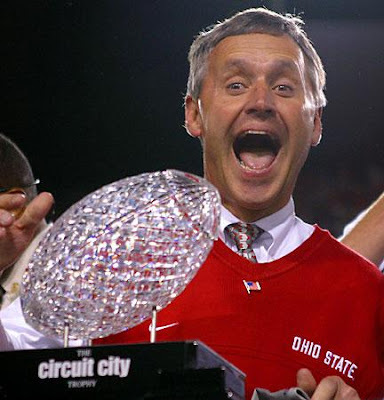 JoPa's contract pays him $1.5 million a year and goes until whenever he damn well pleases, thank you very much. 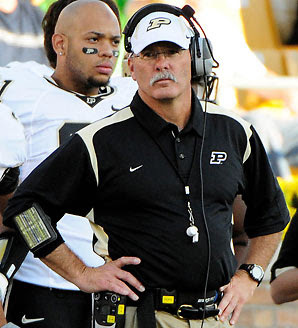 First off, Danny Hope was the shoe-in for HC for Joe Tiller when he retired after the 2008 season. Odds are, he met his expectations for the 2009 campaign by going 5-7. But of those 5 wins, he beat tOSU and Michigan. Of the 7 losses, one of them was by 2 points at Autzen Stadium on September 12. No question, if Hope can get some talent into that system in West Lafayette, he can do some serious damage in the Big Ten. I won't go into what kind of guy I think Hope is, we did plenty of that last November, but I will say that I know he's no fan of Rodriguez...and vice-versa. Clearly, Purdue has had Michigan's number the last 2 years. No doubt, that game is one of the big ones on Purdue's relative cakewalk schedule for the 2010 season. Last season, we said Bret needed a good year to stay safe. I'll go ahead and say it was just that - good. But how long can Wisconsin fans hang on to just being...good? How long can they sustain losing to the tOSU's, the Michigan's and the Iowa's of the conference year-in and year-out? Bret has literally one more season to show his worth in Madison before he's either fired, or gets the heat turned way up. I mean 2009 was a fine season. 10 wins is nothing to scoff at. 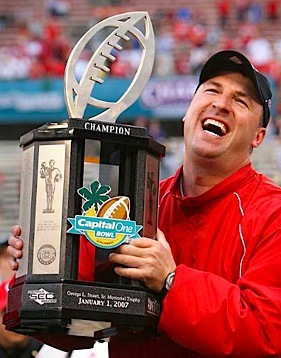 But mid-season losses to tOSU and Iowa in back-to-back seasons just par for the course for Bielema. He must win the bigger games this year to save himself.